Historic New England wants you to know how to conserve and care for your old or historic home, whether it was built in 1750 or 1950. Qualifying membership at Historic New England provides additional services tailored to the specific issues you encounter in your home. Are there resources for people looking to buy or sell historic properties? Finding the right buyer for your historic property is important and requires marketing that focuses on reaching other homeowners with an appreciation for historic houses. Once you have made the decision to sell, Historic New England recommends finding a real estate broker who understands the valuable and unique characteristics of older houses and has experience selling older and historic properties. One resource in New England is Antique Homes magazine, a quarterly publication dedicated specifically to buyers and sellers of older/historic properties. Can I advertise my historic property on Historic New England’s website? Historic New England does not advertise third-party listings for historic properties. Visitors to the website may see listings for historic houses, but these are either part of Historic New England’s Preservation Easement Program or owned by the organization. Does Historic New England accept donations of historic homes? If you are considering the donation of your historic home either as an outright gift or through estate planning, please visit our Donate page and look for the Planned Giving section. If you are considering donation of a preservation easement please visit our Preservation Easement Program page, or call 617-994-6642. How can I find home insurance that will appropriately protect my historic property? Finding the right insurance for an old or historic home can be a challenge. Most insurance companies gear their policies towards newer homes, ignoring the intrinsic value of historic buildings. Homeowners should look for companies that offer Guaranteed Full Replacement Costs and whose claims philosophy allows for the restoration (not just replacement) of your historic home. Make sure you have enough coverage. If your policy contains a co-insurance clause it is required that the policy holder maintain a minimum limit of property insurance (usually 80-90 percent) to avoid a decrease in your claim payment. It may also be a good idea to include coverage for outdoor property such as stone walls, fencing, etc. Most importantly, work with an agent or broker who has experience insuring historic properties. They will be able to offer you solid advice, help you take advantage of credits, and ensure you peace of mind. One resource available for homeowners is the National Trust Insurance Services, LLC program. Where can I find a preservation professional/consultant? What services do preservation consultants offer? Historic preservation consultants are a valuable resource for owners of historic homes. They can provide a range of services, including historic mortar analysis, historic paint analysis, historic structure reports and building conditions assessments, conservation and treatment assessments, National Register nominations, state and federal rehabilitation tax credit applications, and structural engineering. Historic preservation consultants are also hired to provide a variety of services for public and private sector projects, including architectural surveys and inventories, local preservation plans, design guidelines, environmental impact documentation, and cultural landscape reports. How do I find reliable contractors to work on my historic property? The best place to begin the search for a qualified contractor or craftperson for your historic house project is to consult the directories maintained by the New England statewide preservation non-profit organizations (see above). Other sources of information on building practices for historic properties include Old House Journal and Traditional Building magazines. Trade shows or old house fairs, which a local or statewide preservation organization or historical society may sponsor in your area, also provide information on building services and access to contractors and/or companies familiar with historic properties. Remember to always get multiple bids on any work proposed for your house, to obtain references from each bidder, and to check out the references you receive. It is important to educate yourself about old houses and the kinds of issues you may encounter. In addition, the more technical knowledge you have about specific work that needs to be done, the easier it will be for you to ask the right questions and be confident that your contractor will do the job the right way and not leave you with a larger problem in the future. A good resource that lays out the kinds of issues you encounter in older homes and the correct methods for repair is Renovating Old Houses: Bringing New Life to Vintage Homes by George Nash. Another great resource, particularly for homeowners just beginning the renovation process, is Historic New England membership. Historic Homeowner members at the Sustainer level and above receive one online consultation to evaluate design or construction proposals annually as well as access to staff expertise for technical assistance related to the care and maintenance of historic houses. A further benefit at this membership level is contact information for vetted contractors and preservation professionals. Join online or call 617-994-5910. What funding sources are available for historic homes? Unfortunately, there is very limited funding available for privately owned historic homes. Most historic preservation grant programs are restricted to local governments or non-profit organizations. Please visit the Regional Resources section for additional information and links to funding programs in New England. Where can I find information about historic wallpaper, architectural finishes, and historic objects? Historic New England maintains a collections and conservation facility in Haverhill, Massachusetts. Contact collection services staff for all questions regarding the conservation and care of historic wallpaper and wall coverings, textiles, furniture, and objects. Please call 617-994-4788 or email [email protected]. How can I date my house and its architectural features? Determining a likely date of construction for an old house usually requires both historical and architectural research. Your State Historic Preservation Office (SHPO) has architectural survey information documenting many historic properties; you should check with staff there to determine if your house has been inventoried as part of a comprehensive survey of historic resources in your community. Historical documentary research that you can do yourself includes reviewing deed and probate information, tax records, city directories, and local histories. Your local library or historical society may also have other pertinent information, such as historic photographs or maps. Documentary research can be quite conclusive, but in some cases physical investigation will be necessary to supplement and/or corroborate the documentary evidence. The investigation of architectural fabric may require a more trained eye and some technical assistance from a preservation consultant (see above). What is dendrochronology? Can I use it to date my house? Dendrochronology is a scientific method of dating wooden timbers based on the analysis of tree rings. By analyzing core samples, variations in the width of rings help scientists to determine the years during which a specific tree grew. These variations occur as a result of yearly rainfall and climactic conditions and tend to be consistent in a given region. Thus, overall patterns develop and these patterns help to form “master” reference chronologies for a given species of tree in the region. After a master chronology is developed, tree-ring patterns from undated timbers can be matched with patterns in the existing chronology to determine the date of a specific timber. So far, master chronologies have been developed for red and white oak in eastern Massachusetts. Between 2001 and 2003 in conjunction with the Oxford Dendrochronology Laboratory, Historic New England developed chronologies that helped to date several important seventeenth-century houses in Massachusetts. For more information about dendrochronology, visit the National Oceanic and Atmospheric Administration’s Tree-Ring Databank, the Oxford Tree-Ring Laboratory, or the Oxford Dendrochronology Laboratory. How can I make my older house more energy efficient? There are lots of easy and inexpensive ways to improve the energy efficiency of an older home. Many of these methods also involve little or no impact to historic features. A first tier of projects might include: installing a programmable thermostat, weather-stripping windows, and installing door sweeps, and insulating pipes and ductwork (and your hot water heater). Other relatively inexpensive projects with solid returns include: installing storm windows and doors, insulating the floor of your attic, and replacing your old furnace and appliances with more efficient models. An energy audit is also a good early step to help you evaluate problem areas in your home. What is an energy audit? How do I find a company to do my energy audit? A home energy audit assesses how much energy your home consumes and evaluates how you can make your home more energy efficient. An audit can pinpoint where your house is losing energy and determine the efficiency of your home’s heating and cooling systems. An audit may also show you ways to conserve hot water and electricity. You can perform a simple energy audit yourself, or have a professional energy auditor carry out a more thorough audit. There are several places where you can locate professional energy auditing services. Your state or local government energy or weatherization office can help identify local companies or organizations that perform audits. Your electric or gas utility may conduct residential energy audits or recommend local auditors. Please be aware that some companies offering energy audit services also specialize in energy-related products and sales. As with any contract, you should ask for references and check them before selecting a company. What color should I paint my house? Choosing paint colors based on the colors used when a house was constructed, and then applying the paint according to traditional practice, enhances the appearance of all historic houses. There are several ways to determine what paint colors will work to highlight the architectural features and distinctive character of your historic house. Paint color analysis, which must be done by trained consultants, authenticates the exact paint colors used on your house over time. Paint color can also be selected using known historical precedents for the age and architectural style of your house. Historic New England members at the Sustainer level and above receive individualized paint color consultation to help select appropriate colors based on historical principles. Historic New England also sells a color card featuring historic paint colors and including information on period colors and paint suppliers. Where can I find appropriate hardware and fixtures for my historic house? Two good sources for hardware fixtures, as well as a host of other products related to historic houses, are Old-House Journal and Traditional Building magazines. Both of these periodicals should be available at your local bookstore and/or library. Historic New England members at the Sustainer level and above receive access to additional sources of supplies and materials for historic houses. Sally Zimmerman, whose background is in architectural history and preservation planning, joined the Historic New England historic preservation team in 2006. Sally manages Historic New England homeowner member benefits, which offer best practices preservation advice. She is a co-author of Painting Historic Exteriors: Colors, Application, and Regulation and is a frequent speaker on issues relating to energy conservation in older homes. Prior to joining Historic New England, Sally served as a preservation planner for the City of Cambridge for almost twenty years. 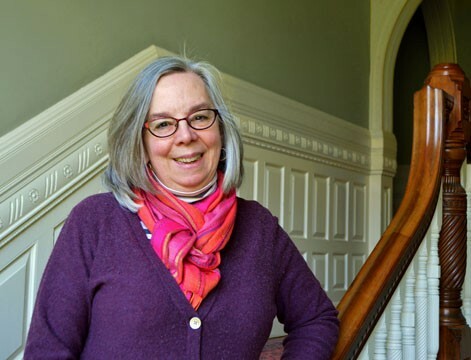 She has also worked for the Massachusetts Historical Commission as an architectural historian, and as a National Register consultant for the Connecticut Historical Commission. Sally received her M.A. in preservation studies from Boston University, and a B.A. in American history from Mount Holyoke College. You can reach Sally at 617-994-6645 or [email protected]. Protect your old or historic home with a Historic New England preservation easement. Visit Historic New England's museum properties.